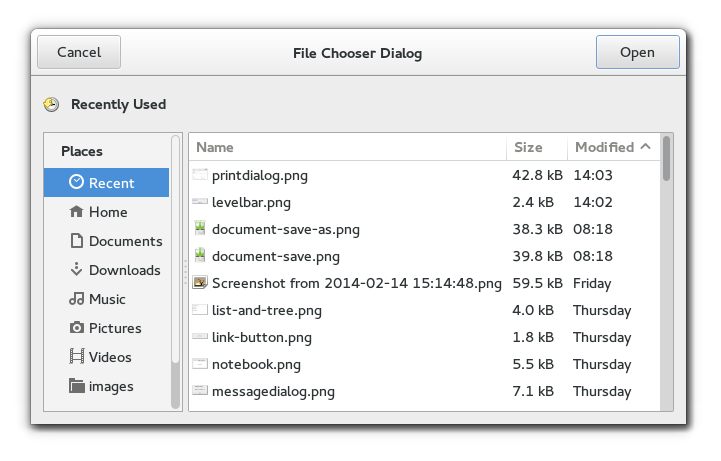 FileChooserDialog is a dialog box suitable for use with “File/Open” or “File/Save as” commands. This widget works by putting a FileChooserWidget inside a Dialog. It exposes the FileChooser interface, so you can use all of the FileChooser functions on the file chooser dialog as well as those for Dialog. Note that FileChooserDialog does not have any methods of its own. Instead, you should use the functions that work on a FileChooser. If you want to integrate well with the platform you should use the FileChooserNative API, which will use a platform-specific dialog if available and fall back to GtkFileChooserDialog otherwise. To select a file for opening. Use OPEN. To save a file for the first time. Use SAVE, and suggest a name such as “Untitled” with set_current_name. To save a file under a different name. Use SAVE, and set the existing filename with set_filename. To choose a folder instead of a file. Use SELECT_FOLDER. Note that old versions of the file chooser’s documentation suggested using set_current_folder in various situations, with the intention of letting the application suggest a reasonable default folder. This is no longer considered to be a good policy, as now the file chooser is able to make good suggestions on its own. In general, you should only cause the file chooser to show a specific folder when it is appropriate to use set_filename, i.e. when you are doing a Save As command and you already have a file saved somewhere. This is because FileChooserDialog must intercept responses and switch to folders if appropriate, rather than letting the dialog terminate — the implementation uses these known response codes to know which responses can be blocked if appropriate. To summarize, make sure you use a stock response code when you use FileChooserDialog to ensure proper operation.